Talking of absences EUREKA (11 Mondays 11.30pm) is back on the free-to-air! The Ten Network has held back the fifth and final season for reasons known only to themselves. Yeah, I guess I could have viewed it some other way, like getting the box set, but there are times when I like being all Generation X-ish and so I’ve been recording eps on my Korean Teevo and zapping through the ads, just like we did in the VHS era. Eureka is a town full of geniuses in Oregon. They are employed by the Department of Defense, and a company called Global Dynamics, to come up with brilliant inventions. It’s a modern day version of the Manhattan Project. Most episodes have a formula; an invention will go wrong and wreak havoc. The series plays with the old somewhat anti-science ‘there are some things that man was not meant to know’ idea. The solution to the problem-of-the-week is always scientific, so the cake is had and eaten simultaneously…by Schrödinger’s cat. The show is science fiction and doesn’t drift into fantasy which is one of the many things I like about it. The fifth season arc involves the events following the launch of the spacecraft Astraeus. The main characters in the cast are now Zane, Henry, Alison, Fargo, Jo Lupo and Sheriff Carter. 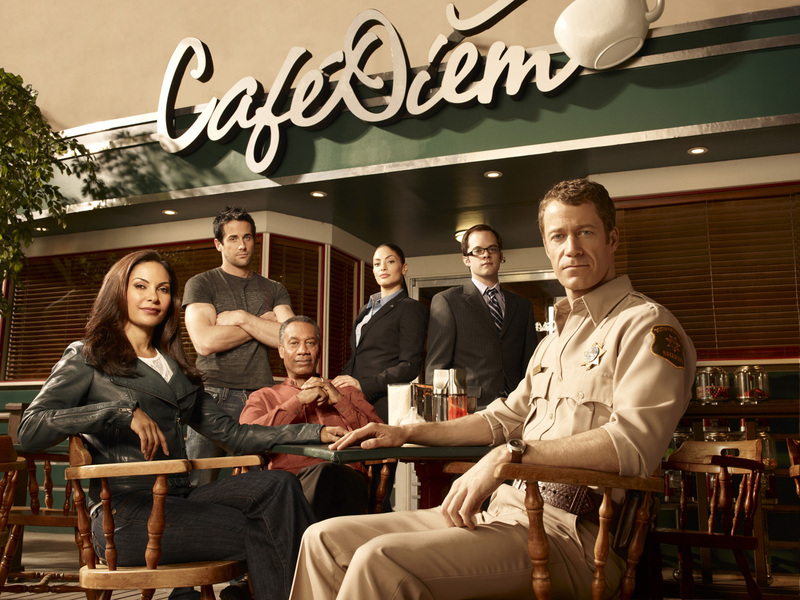 Colin Ferguson’s genial comic presence as Carter ties the whole thing together. Like the spy show CHUCK, this series has done well to squeeze 5 seasons from its premise, many series run out of puff long before they hit this milestone. Which brings me to DOCTOR WHO (ABC Sundays 7.40pm). It is 34 seasons old if you’re numbering from the beginning in 1963, but only 8 seasons old if you go from its 2005 reboot. I am wondering if it’s gasping for breath somewhat. If regular Spongers cast their mind back two-and-a-half-years you may recall I wasn’t enamoured of the series then and had some unkind things to say about Doctor 11, Matt Smith. I wasn’t a fan. I am a fan of Peter Capaldi, the actor who plays Doctor 12 in season 8 of Nu-Who. I’ve liked his work since the Bill Forsyth film LOCAL HERO (1983). However, not even his undoubted excellences as an actor can make up for the ‘meh’ quality of the current season. Despite liking this new Doctor, I still don’t like the writing. Showrunner Steven Moffat keeps cranking out material that I find sub-par. On the good side, Jenna Coleman finally has a character rather than a cipher to work with, so her performance has improved immensely. Sadly, six episodes in, I find I don’t care too much about adventures of this new Time Lord, which is how I felt for the entire Matt Smith era. Looking online, I see there are plenty who disagree and find interest in the old series still, so I believe I am the problem here. I believe I have just seen it too much since my childhood and nothing about the concept feels fresh any more. So perhaps it’s time to stop watching a show aimed at a much younger audience to whom all this seems new. MARVEL’S AGENTS OF S.H.I.E.L.D (7 Mondays 9.30pm) is clearly for the younglings, what with all the murderous super-villains and deadly betrayals. Season 1 gave us the Mother of all hostile takeovers when Hydra, the evil organization that was always hidden within S.H.I.E.L.D., stepped out of the shadows and showed their 21st century Nazi selves. Unusually this was foreshadowed by a series of films (the Marvel Cinematic Universe) and came to a head on television simultaneously with CAPTAIN AMERICA: The WINTER SOLDIER at the movies. Unfortunately, a large chunk of the audience had abandoned AGENTS OF S.H.I.E.L.D. by this point. This was due mostly to its feeling more like a supernatural procedural than the kind of thing Marvel fans were looking for. Not being a Marvel fan, I never worry about elements like the accuracy of TV Deathlok character compared to comic book Deathlok. It isn’t on my radar. From the get-go, I enjoyed the team dynamic and smart-assery of Season 1 . However, since the storyline intersected with the MCU’s Hydra arc, I think the series has improved. Fictional S.H.I.E.L.D survived Hydra and the show survived its drop in ratings and was somehow renewed for a second season. Showrunners Jed Whedon and Maurissa Tancharoen are proceeding with noticeably greater confidence in their material. This is the Internet, so arguably, Tom Gleisner, Rob Sitch, Santo Cilauro and Jane Kennedy of Working Dog Productions have been responsible for some of the best comedy (i.e. champagne comedy) on Australian television; from FRONTLINE through to THE PANEL and THANK GOD YOU’RE HERE they have produced some solid hits. Their latest, UTOPIA (ABC Wednesdays 8.30pm) has garnered a lot of positive attention and I’m not sure why. (Just to be clear, I’m talking about the Australian comedy series, not the UK drama series from Channel 4.) The premise is that Rob Sitch’s character Tony is the head of the fictional NBA-Nation Building Authority and he is more or less surrounded by incompetents. To his chagrin the NBA does little except trumpet its successes through social and mainstream media. The template for the show is the slightly less funny THE HOLLOWMEN (2008) and ultimately their much funnier FRONTLINE (1994). UTOPIA and THE HOLLOWMEN both suffer from a lack of edge. Gleisner, Sitch and Cilauro who write the episodes, are rather kind to their subjects. Doubtless this well-intentioned, good hearted approach speaks well of them as human beings, but it leaves me wondering what their series are about. THE HOLLOWMEN is set in a policy advisory unit created by the Prime Minister. The political world presented to the audience is civilized and free from bitterness or bastardry. Something similar is going on in UTOPIA. Hardly anyone is jockeying for position­–the one character who clearly was doing this was brought on for a single episode­–and there is no backbiting or blame shifting. What office worker on the planet can say this, let alone anyone who has worked in a government department? Sitch’s Tony is the exasperated boss of a group of dim, barely-skilled workers. The power dynamic is more like an ever-patient schoolteacher wrangling six-year-olds. The only one who understands her job and tries to do it to the best of her abilities is Nat. Nat is played by Celia Pacquola and her understated performance is one of the pleasures of the show. There are funny moments and good observations. In the last episode they got a lot of mileage out of Tony’s new frosted glass door (“Close it until you hear a sound”). The way the arrival of snacks tend to slow down meetings absolutely has the ring of truth about it. But the bigger picture stuff isn’t there. I find it difficult to accept that someone with as little outward ambition as Tony is heading up the Authority. For a series that seems to be a satire of Australian bureaucracy, the subject of power and ambition is rarely visited. Panel show REALITY CHECK (ABC Wednesdays 9.00pm) has screened in tandem with UTOPIA. Both have completed their run. REALITY CHECK takes its cues from Cordell Jigsaw Zapruder stable mate THE GRUEN TRANSFER. Rather than taking on advertising, REALITY CHECK lifts the lid on reality TV (duh!). The panelists have experience in the reality form either as contestants that made it into the entertainment biz, like Poh Ling Yeow or Rob Mills, or as producers like Julian Cress or Marion Farrelly. The host is stand-up and radio presenter Tom Ballard. The show has hit its stride quickly. Absurd scenes from international reality programs are mocked and the experts are asked about what is staged and how. Australia’s THE BLOCK and BIG BROTHER are often the examples used, but frequent panelist Ian “Dicko” Dickson brings in his experience of being an AUSTRALIAN IDOL judge and a CELEBRITY APPRENTICE AUSTRALIA contestant. If you’re not a fan of the form, this show won’t change your opinion, but if you are curious about what goes on behind-the- scenes, it provides some interesting answers.REALITY CHECK is a fun and palatable way for people like me to experience reality programming without putting in the hours.